Developments in the first quarter of this year have raised two interesting questions about the outlook for the Malaysian economy. The first is whether GDP growth could actually touch or exceed 5% for 2017; after all 1Q GDP growth was 5.6% yoy, much higher than consensus expectations of 4.8%. The second is that given the current growth rate, and the latest print on inflation at 4.5%, could policy rates rise earlier than what consensus believes? In my view, import demand from China is likely to decline in the coming quarters and that moderation in export growth will feed through to the domestic economy. As such, the current growth momentum should recede and GDP growth for this year is likely to fall short of 5%. Under this scenario, rates should stay steady given that inflationary pressures are mainly cost push for now. However, if growth remains strong, then via higher wage growth inflationary pressures may become demand pull. In the event, the policy rate is likely to be increased. The MYR is currently well supported by inflows and as long as the USD and US bond yields stay soft, the current appreciation trend should continue. However, we believe that with an expected divergence in monetary policy between the Fed and other major central banks, the USD is likely to strengthen toward the end of the year. Moreover, the RMB is likely to weaken as Chinese growth momentum slows. Both these events will put pressure on all regional currencies, including the MYR. A huge surprise on growth but is it sustainable? In 1Q17 GDP grew by 5.6%, much faster than consensus estimates. A look at the numbers suggests that the growth was broad based. Domestic demand grew by 7.7% yoy, a sharp pickup from the 4.3% rate in 2016. The rise in exports of goods and services was even more dramatic, up 9.8% in 1Q17 from 1.1% in 2016. The good news in 1Q17 did not end with the headline numbers. 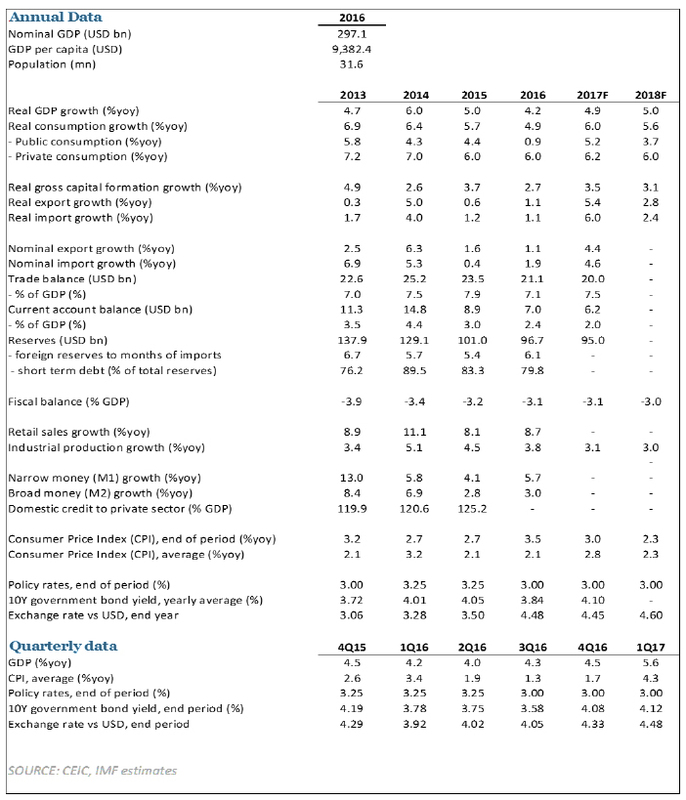 Private consumption demand increased by 6.6%, backed by stable wage growth of 4.5%; private investment increased by 12.9% indicating a possible reaction from the rise in manufacturing output; monetary aggregates are rebounding; and sentiment indicators from both the business and consumer side have ticked up. On the supply side of the economy too, the pickup was broad based, with services rising 5.8% (vs 5.6% in 2016) and manufacturing up by 5.6% (vs 4.4% in 2016). Agriculture increased by 8.3% versus a 5.1% decline in 2016. Clearly, there is something good going on in the economy. Yet, it is difficult to see the current momentum being sustained. Exports, mainly manufacturing and commodities, are driving growth. The rise in manufacturing and trade is a global trend that reflects improved global economic conditions. As I have argued, I am still cautious on the pace of the global recovery1. In particular, I expect the improvement in the US to be modest and for the Chinese economy to slow down. Besides, the global trade multiplier is at a multi-year low. The other factors are commodities and the value of the currency, together affecting the economy in more ways than one. Commodity exports have been strong, commodity prices are significantly up on a year on year basis, and the ringgit has been weaker. It is therefore not surprising that while exports were up 9.8% in real terms in 1Q17, in ringgit terms, they were up by 21.4% yoy. One can clearly see the income effect and hence the spillover on to consumption demand. Further, the rise in manufacturing exports is having a positive impact on capex plans. If exports moderate as I expect, so should several other parts of the economy. Moreover, the rise in inflation is affecting both real incomes and returns and, if sustained, is likely to affect both consumer and business decisions. I have upgraded out GDP forecast for 2017 to 4.9% (5% for 2018), with a balanced risk on both the down and upside, depending on how the global economy plays out. The timing on the moderation of the Chinese economy will be crucial. If the current pace of expansion lasts a couple of more quarters, and Malaysian exports maintain a torrid pace, the spillover on to the domestic economy is likely to be more sustained. While exports were up 21.4% in RM terms, import growth was even stronger, up 27.7%, resulting in a smaller trade balance of RM18.9 billion in 1Q17 versus RM23.9 billion in 1Q16. The decline in the trade surplus is not a cause for concern. Both these trends reflect healthy developments: a recovering global economy and improving domestic demand in Malaysia. The central bank’s external reserves were USD97.3 billion as of 15 May 2017. The reserves position is sufficient to covers 7.8 months of retained imports and 1.1 times short-term external debt. The reserve level reflects significant capital inflows. Is there an inflation problem? Headline inflation increased by 4.3% in 1Q17 and by 4.4% in April. The increases are mainly cost driven for now; RON95 prices averaged nearly 30% higher in 1Q17 versus 1Q16. Besides energy prices, there was a general rise in cost push inflation, but this increase has been contained so far. BNM constructs an inflation pervasiveness index that shows how widespread inflation pressures are and that has been broadly stable. This however does not mean that these pressures will stay contained forever. Currently, demand pull pressures – the kind that would mandate a policy response – are very modest. But they are not non-existent. Under normal circumstances, cost push pressures should fade on their own, though they are likely to take a toll on demand. But if external demand stays strong, the adjustment through domestic demand may not happen and we will have demand pull pressures. Wage growth is worth watching. It is currently stable, but with 3.5% unemployment and rising domestic demand, an uptick is quite possible. I can safely say that rate cuts are over for now. The key question is whether rates could go up. My base case, based on slowing exports and inflation staying contained, is that policy rates stay stable for this year. But it is a close call and may depend crucially on the timing of several factors. If domestic demand stays close to the 1Q clip for another quarter or two, or if the Fed moves more aggressively than the two hikes I expect, or if for some reason – say geopolitics — the currency comes under renewed pressure, BNM may move on the policy rate. For now, I expect the current trend of ringgit appreciation to continue in line with inflows. However, I believe that with an expected divergence in monetary policy between the Fed and other major central banks, the USD is likely to strengthen toward the end of the year. Moreover, the RMB is likely to weaken as Chinese growth momentum slows. Both these events will put pressure on all regional currencies, including the ringgit. I expect the MYR to end the year at around 4.45 to the USD.